American earth ionosphere satellite. 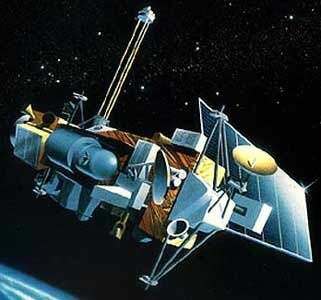 The Upper Atmospheric Research Satellite was designed to study the physical and chemical processes occurring in the Earth's upper atmosphere (between 15 and 100 km). Earth Observing satellite built by GE Astro Space, Fairchild (Bus) for NASA, USA. Launched 1991. Used the MMS bus. AKA: Upper Atmosphere Research Satellite. Status: Operational 1991. First Launch: 1991-09-12. Last Launch: 1991-09-12. Number: 1 . Gross mass: 6,795 kg (14,980 lb). Height: 9.80 m (32.10 ft). Cryogenic Limb Array Etalon Spectrometer (CLEAS). Improved Stratospheric and Mesospheric Sounder (ISAMS). High Resolution Doppler Imager (HRDI). Solar-Stellar Irradiance Comparison Experiment (SOLSTICE). Solar Ultraviolet Spectral Irradiance Monitor (SUSIM). Active Cavity Radiometer Irradiance Monitor (ACRIM II). Family: Earth, Ionosphere sat, Medium earth orbit. Country: USA. Launch Sites: Cape Canaveral, Cape Canaveral LC39A. Agency: NASA, Astro Space, Fairchild. Bibliography: 2, 279, 6, 7003.